TEACH is the world's biggest whiteboard, so that kids are always active and engaged in the classroom! TEACH, allows you to work within your own virtual whiteboard, but also collaborate with others to create an active classroom experience. I coached the math team in high school and tutored struggling students in physics and French after school, so I know a lot about how we learn what we know. I learned about the power of a whiteboard in bringing people together and fostering team spirit. I loved the way that students can look to other students for help. Often the most impotant factor of a lesson learned is that it does not come from an authority figure, but rather a friend. I want to make sure kids know that they are smart enough and strong enough to accomplished things on their own. 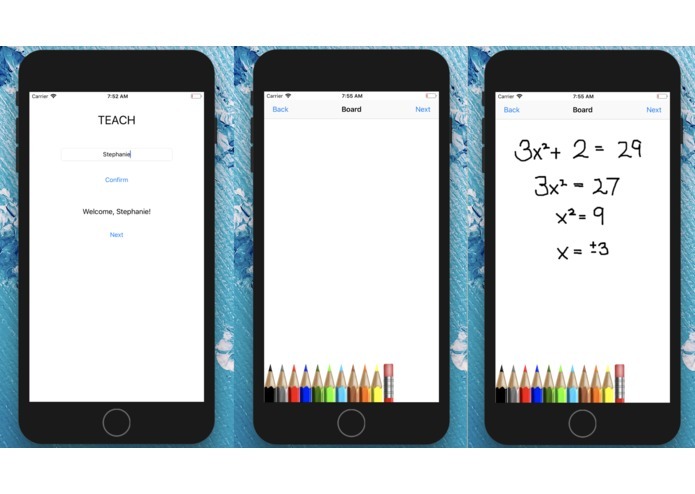 TEACH allows teachers to bring as many kids to the whiteboard as they want, by having the same whiteboard effect on mobile phones in the classroom! TEACH could be used in lecture halls with 100's of people because of its immense reach and scope. I learned Swift and mobile development in XCode. A challenge - yes! But such a rewarding one! Understanding the flow of something I use so much in my own life. Truly getting iOS and wanting to pursue it even more. iOS is amazing and might even steal me away from the world of web dev for a while - haha! But really though, it's just so much more pervasive and accessible to everyone, always. It felt really good to formally work towards building something that I hope to use in the classrooms one day. A LOT. Because this was my first time with mobile development, so no, I did not make an app with real-time working of all your peers. The app doesn't take attendance, have means of erasing, or include a button that alerts the teacher when you're stuck, but these are all features that I will develop in the future to ensure students and teachers can enjoy my app to the fullest. I learned Swift and mobile development for iOS in XCode for this project. I was glad to be working with education, which I am incredibly passionate about! I also enjoyed learning something completely new, as I have previously pursued only web app projects at hackathons!